An article by Kevin McGarry for The New York Times. Here are the photos of the Bahamas exhibit. Follow the link below for additional photos. : The Caribbean country also made a splash, but an unexpectedly cold one. Its pavilion offers a rumination by Tavares Strachan on the 1909 expedition by Robert Peary and Matthew Alexander Henson to the North Pole. 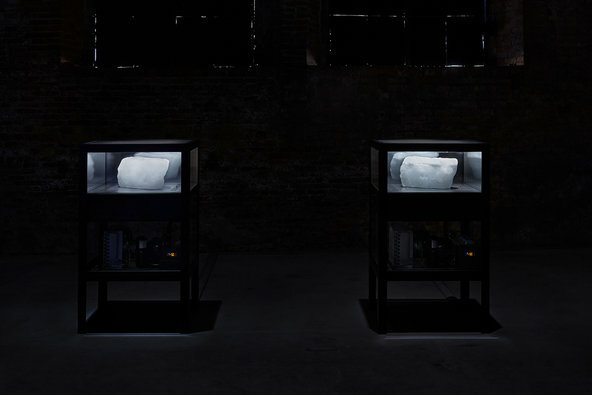 It includes a pair of ice blocks under glass, one harvested from Strachan’s own journey to the North Pole, the other a chemically exact synthesized copy, poetically paralleling questions about which man — the one of European or African descent — was truly the first to reach the pole and plant the American flag. Bahrain: This group presentation by Mariam Haji, Waheeda Malullah and Camille Zakharia from the tiny island nation in the Persian Gulf offers a remarkably free expression of local culture and identity. The best is a series of photographs by Malullah that follows a woman veiled in a head-to-toe black abaya, carrying a cluster of purple balloons through a modernizing but conflict-prone urban landscape, past bullet holes and along a coastline of half-completed high rises. Tuvalu: Located not in Venice but in the mainland city of Mestre about 45 minutes away, this pavilion features an allegory of climate change and transnational corporate interest by the Taiwanese artist Vincent J. F. Huang that is so ham-handed it borders on brilliance. The centerpiece is a hybrid oil pump-meets-guillotine, from which a slain likeness of the Wall Street bull hangs by its hind legs. Nearby are other sculptural “animal victims” of capitalism, to use the words of the artist, including a tortoise whose head is about to be cut off by the machine. 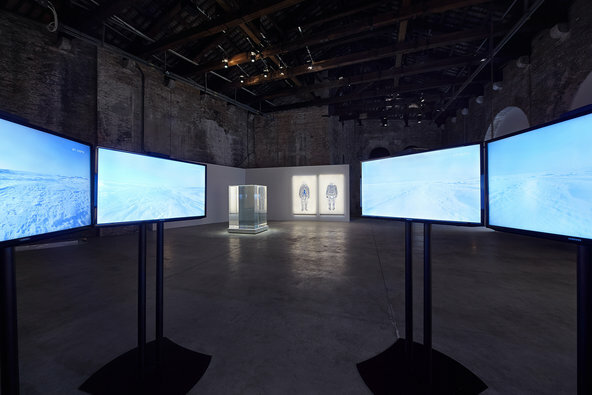 Titled “Destiny Intertwined,” the installation is supposed to alert audiences to the rising water levels that threaten both Tuvalu and Venice. The first step in keeping Tuvalu from being wiped off the map is knowing that Tuvalu is on the map in the first place.